Brass players are indebted to French composers who wrote much of their music as test pieces highlighting all aspects of the instrument’s techniques. This lovely piece, Villanelle by Paul Dukas, is, in my opinion, one of the very best of its kind. It was written in 1906 for the Paris Conservatoire. 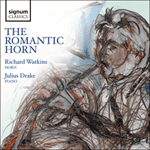 At its core is the beautiful opening melody to test the lyrical side of the horn—this also has the option of being played using the natural harmonics. The rest of the piece follows the usual pattern of more nimble writing followed by a ‘stopped’ passage where Dukas instructs the player to transpose a semitone higher. This gives the sound a unique and ethereal quality which Dukas also used in his Sorcerer’s Apprentice. Villanelle then explores the muted sounds and ends virtuosically. We are very fortunate to have this piece in our repertoire as Dukas destroyed much of his music and it is a great favourite amongst horn players.